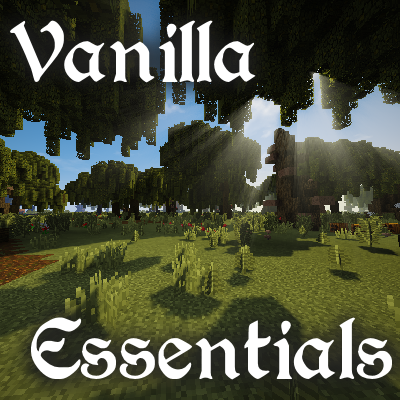 Vanilla Minecraft with Forge and some essential mods that don't add new blocks, items or worldgen but provides great quality-of-life features. Player will experience the regular vanilla gameplay the way it should be with all small tweaks, features and enhanced optimization. Immerse into the world while playing well-known game on old map(you don't need to create new map) or create a brand new world. Modpack will be useful for those who play vanilla, providing small features that you even never thought about and for creative builders, who just love to build, making videos and timelapses. Again, this modpack don't add new blocks or items, so you can change minecraft versions easily, delete mods or join servers without fear to lose anything. Enhanced visuals will apply different visuals effects when you walk on sand, dive into the water or receive damage. With Dynamic Surroundings you will experience things like auroras, footprints, footsteps, item use sounds and different realistic block features like steam jets, water ripples, fireflies, etc. Sound Filters will add reverb to caves making them more atmospheric and scarier to walk in. Key wizards will help you manage your keybindigs and avoid conflicts. 'Just enough items' mod will show you all the items in-game, their recipe, alongside with addons that will show you mob drops and how to create banners. Every enchantment now have a description. You can create notes in-game(e.g. todo lists). Leaves decaying much faster(this works only in singleplayer). Tweaks for inventory(inventory sorting feature, tool replacement,) and mouse(drag item to place them to chest etc). Some performance improvements with Better Fps mod. Light level and chunk borders overlay. No mob spawning on trees. Hold shift to see holographic content display of what's in the chest\furnace\etc. This is vanilla pack with client-side mods so FPS shouldn't be a problem but If you want even more FPS you can disable weather effect in Dynamic Surroundings config(or in-game). *Some features from mods such as Dynamic Surroundings\FastLeafDecay\etc will not work on servers.